Hey everybody! Ever since I posted my latest cake photo on my page, I received several messages from fellow cake decorators asking how I made my cake light up! So, fortunately I was thinking ahead and snapped a few photos to share with you guys! 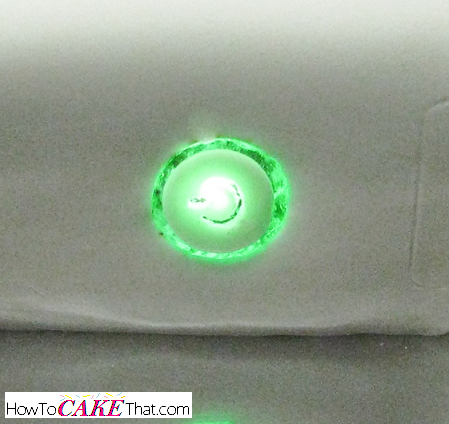 It's not a full cake decorating tutorial - just a little quick tutorial showing how to make the little clear green power button on the Xbox 360 console. Hope you enjoy! 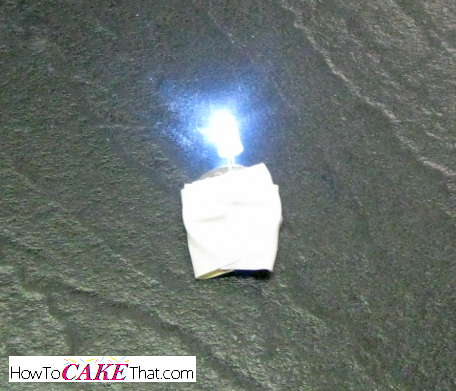 Okay, the first thing you'll need for a light-up cake is a light! The best kind to use for cakes is LED lights because they do not generate heat and also do not need much power to operate - meaning small batteries can power them for a very long time! Where can you find LED lights? Well, there are several places. The first is your local craft store. At most craft stores you can find single LED light and battery sets already set up in clear plastic individual capsules - very convenient, but pricey. Next, you can order single LED light bulbs online, and then purchase coin batteries (watch batteries) to power them. And lastly, you can remove single bulbs from a string of lights. Good quality strings allow for easy removal of single bulbs, but cheaper strings may have the bulb soldered to the wire, and therefore will need to be cut... this is the type of light string I have, so this will be the method I'll be sharing with you today! So, begin by snipping the wires to remove an LED light from the string. 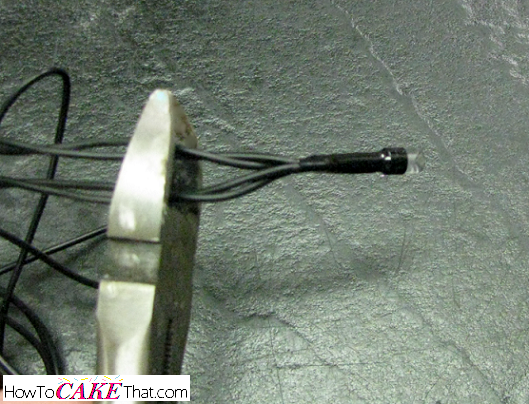 Next, remove any tape or plastic casing to expose where the wires are soldered to the LED prongs. Be careful, the soldering can have sharp pieces. 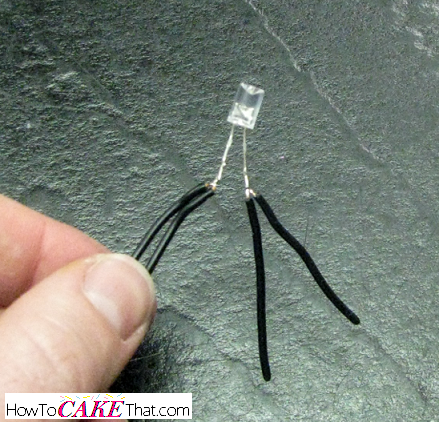 Carefully trim the wires from the LED prongs. 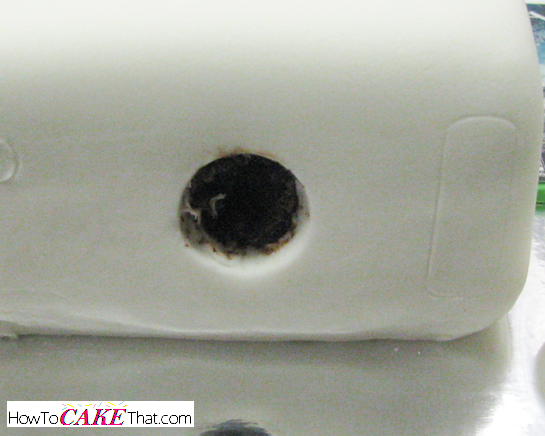 Be sure to leave the prongs long enough to touch each side of the coin battery. Next, double check that the battery and light work. 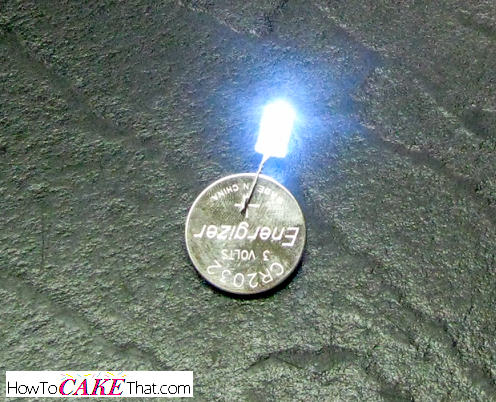 Slide the coin battery between the two LED prongs to see if it lights up. If it doesn't light on the first try, flip the coin battery over and try again. There is a positive and a negative prong on the LED, and the positive and negative sides of the battery must match up or it won't work. Okay, now we're going to begin working on the edible part of the green illuminated console button. 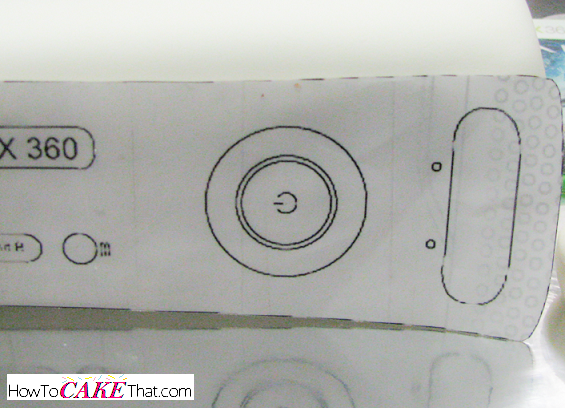 In this photo we have a printed template of the front of an Xbox 360 - template for an Xbox 360 can be found on www.the-blueprints.com or you can click here. There are two round cutters the same sizes as the inner circles of the console button on the template. And also a piece of sugar glass using the edible sugar glass recipe found in the edible decoration recipes section on this site. Once the sugar glass reaches 300 degrees (hard crack stage), immediately remove it from the heat and color it with Wilton's leaf green gel color and spoon out small amounts to form circles close to the size of the circle for the console button onto a greased nonstick baking sheet and allow to cool. First, roll out a tiny bit of gum paste. 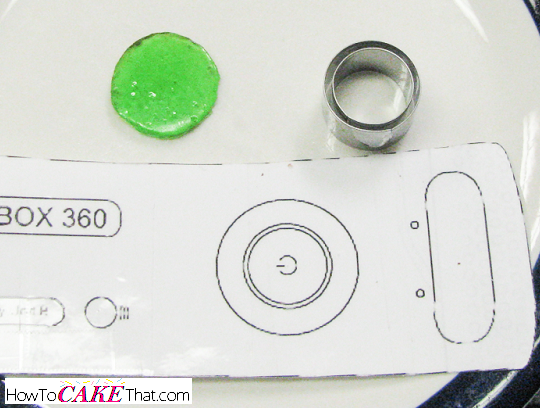 Then, use the smaller circle to cut out the piece that will be the power button symbol. Let the gum paste to sit for 10 to 30 minutes to allow the surface to harden slightly. 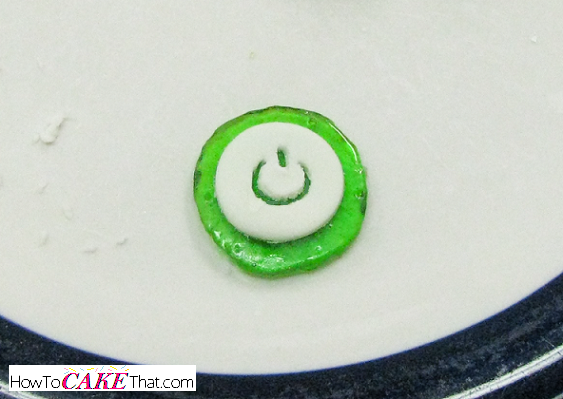 Then, using an Xacto knife, carefully cut out the power symbol in the center of the gum paste circle. Next, adhere the gum paste to the center of the green sugar glass circle. The surface of my sugar glass was sticky, so I didn't need anything to "glue" it. If your gum paste is not sticking, lightly brush the back of your gum paste with a little water to make it stick to the sugar glass. 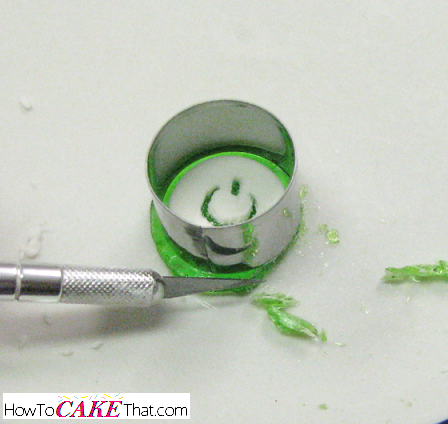 Next, place the larger circle on the sugar glass, ensuring the gum paste circle is perfectly centered and there is an even green ring showing around the gum paste. 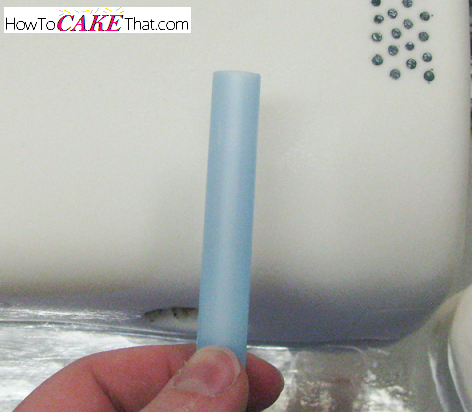 Using an Xacto knife, carefully trim away the excess sugar glass around the circle cutter. 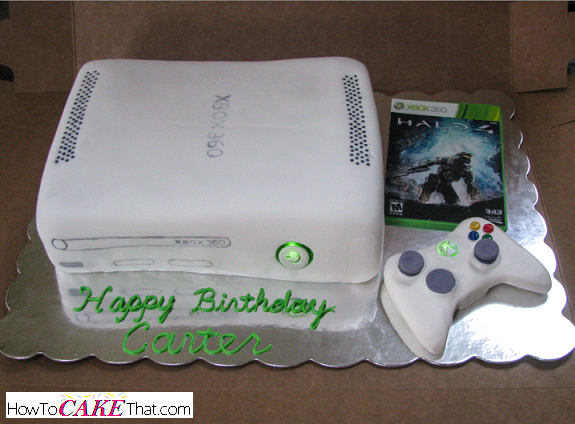 Now it's time to mark where the green console light should go on the carved, fondant-covered Xbox cake. Line up the template on the front of the cake. Using a pin or the tip of the Xacto knife, poke a hole through the center of the power button on the template to mark where we need to cut. Next, line up the large circle cutter (same one used to trim around the green sugar glass), and make sure our mark is perfectly centered. 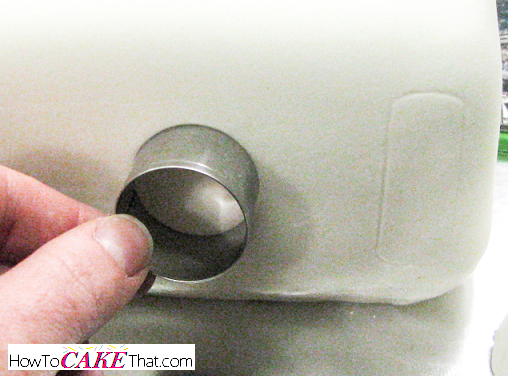 Press the circle cutter into the fondant to remove the piece of fondant and a little cake. 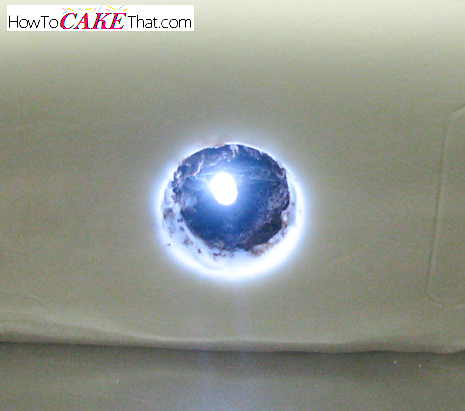 Remove the circle piece of cut fondant, and using a tiny spoon or knife, carve out a little cake to create an open space for our LED light. Now it's time to prepare the light to be inserted into the cake. First, place the battery between the LED light to power the light on. 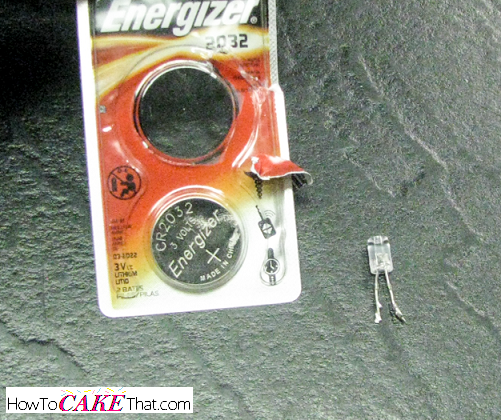 Then, tape the battery and prongs in place with a little electrical tape. We will be using a large plastic straw (tea straw) to insert our light and hold it in place. To measure how long the straw will need to be, hold it above the cake to eye it up and estimate how long the piece will need to be to hold the light steady. Trim to the desired size. Cut a slit in the end of the straw, insert the coin battery, and tape around the battery and straw with masking tape to hold it in place and to also protect the battery from touching any cake. 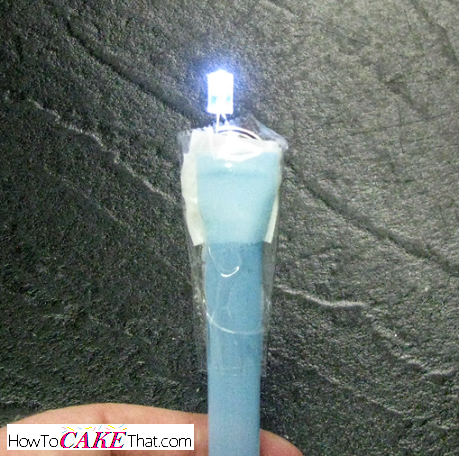 Insert the straw and LED light into the cake. And finally, insert the green sugar glass and power button and press into place. And viola! You now have an Xbox console power button that really lights up!! I hope you have enjoyed this tutorial as much as I have enjoyed putting it together for you! God bless! !